Bring to a boil the butter, milk, sugar and vanilla. Boil for 2 minutes. 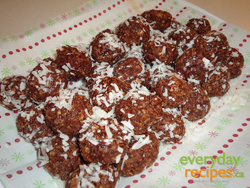 Remove from heat and mix in the rolled oats, coconut and cocoa. Let cool and then roll into balls and roll in coconut. Extremely sweet but very delicious!